follaein Warld War II (1954). Remeened the naitional anthem o Roushie till 2000. Offeecial leid in the courts frae 1937. As Chairman o the VTsIK (Aw-Roushie Central Executive Committee). As Chairman o the Presidium o the Supreme Soviet o the RSFSR, frae 29 Mey 1990 tae 10 Julue 1991, then as Preses o Roushie. The Roushie Democratic Federative Republic exeestit breifly on January 19, 1918, but actual sovereignty wis still in the haunds o the Soviets even efter the Roushie Constituent Assembly opened its first an last session. The Roushie Soviet Federative Socialist Republic (Roushie: Российская Советская Федеративная Социалистическая Республика), commonly referred tae as Soviet Roushie, the Roushie Federation, or semply Roushie, wis the lairgest, maist populous an economically developit republic in the umwhile Soviet Union. The Republic comprised saxteen autonomous republics, five autonomous oblasts, ten autonomous okrugs, sax krais an fowerty oblasts. Roushies formit the lairgest ethnic group. ↑ LENINE'S MIGRATION A QUEER SCENE, Arthur Ransome for the The New York Times, March 16, 1918. ↑ Riasanovsky, Nicholas (2000). A History of Russia (sixth edition). Oxford University Press. p. 458. ISBN 0-19-512179-1. 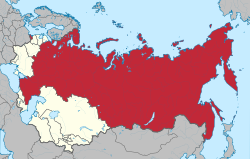 ↑ 7.0 7.1 The Free Dictionary Russian Soviet Federated Socialist Republic. Encyclopedia2.thefreedictionary.com. Retrieved on 22 June 2011. This page wis last eeditit on 12 September 2018, at 06:15.